The Unseeable (2006), also known as Pen choo kab pee, is a Thai horror film directed by Wisit Sasanatieng that is awash in ghosts and a Gothic sense of foreboding. I was curious to see how a culture steeped in ancestor worship and rich supernatural traditions would depict a ghost tale, to see what new cultural elements they might bring to the genre. When I first began watching the film I was struck by the grainy picture and the seeming overuse of haunting music to ramp the tension where it didn’t appear to need it. In my American hubris I chalked this up to being the result of the budget constraints of filming in a poorer nation and of a director trying to imitate Western horror films. My first reaction was, “well, this is quaint.” In my defense, the budget was indeed meager and my feelings were consistent with the vibe of the first 10-15 minutes. However, after going through the entire film I see that I grossly underestimated the filmmaker. I now see how deliberate his artistic choices were as the ending of the film gives a whole new perspective on its beginning. 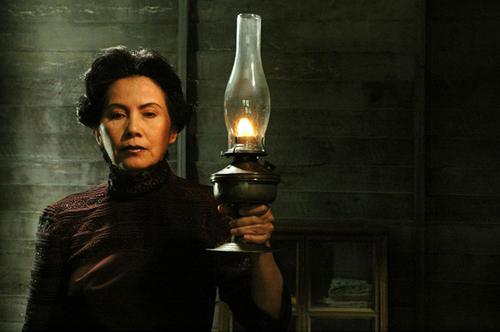 Set in the 1930s, a pregnant woman on her way to Bangkok in search of her husband stays at a creepy estate/compound. It is owned by an elitist woman who some say sleeps with the ghost of her lover in the main house. The place is run by a cold, domineering housemaid straight out of a Gothic melodrama who warns her to stay away from the antique closet. The other two guests include Choy, a superstitious blabbermouth who thinks the only other guest, an old woman who shuffles around the garden at night, is a vampire. Amid this we throw in the apparitions of a man digging at night, a girl who appears and asks to be played with and then disappears again, and a story about a woman who hanged herself from a nearby tree. And of course, just when she’s about to flee our protagonist gives birth and has to stay on longer. The plot carefully distributes these puzzle pieces and asks the viewer to be patient and soak in the atmosphere. The costuming is meant to recall 1930s cinema stars and the visuals are inspired by 1930s and 40s illustrator Hem Vejakorn. The twist(s) at the end are actually quite satisfying and I was surprised at just how well-crafted this classic ghost tale was. There were elements that may have been lost in translation for me, particularly regarding the garden shrine (there was something creepy there I apparently wasn’t seeing most of the time) and the lore of vampires, which works quite differently in Thailand. Dealing smartly with primal fears and desires and crosscut with class conflict, the script was one I found myself pondering long after viewing. It’s just the type of ghost tale I hope to find but rarely do. For those interested in Southeast Asia’s take on the Gothic ghost film, I highly recommend seeing The Unseeable.